There are a number of different SIBO symptoms and treatment options. Small intestinal bacterial overgrowth symptoms include bloating, flatulence and more. Small intestinal bacterial overgrowth (SIBO) is an increasingly recognized condition in which there is an elevated number of bacteria in the small intestines. The small intestine normally contains relatively few bacteria, but with SIBO, bacteria that are normally found in the colon—Escherichia coli, species of Enterococcus, Klebsiella pneumonia and Proteus mirabilis—abnormally expand into the small intestine. These bacteria are notorious for fermenting carbohydrates into gas and their overgrowth is responsible for classic SIBO symptoms like gas and bloating. The good news is that SIBO treatment with either conventional or natural antibiotics is proven effective, especially if a SIBO diet is followed simultaneously. neuropathy (tingling, numbness, or pain in the extremities). In extreme SIBO cases, there may be obvious signs of malabsorption, including weight loss and excessive fat in the stool (steatorrhea). SIBO develops when the normal mechanisms that control balance among the gut bacteria are disrupted. One of the most common processes that leads to bacterial overgrowth syndrome symptoms is decreased gastric acid (hydrochloric acid) secretion. 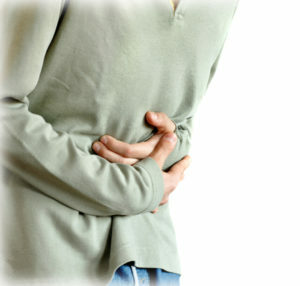 Many people, especially as they get older, don’t make enough hydrochloric acid to properly digest food in the stomach. Heartburn sufferers who regularly use antacids or proton pump inhibiting drugs (purple pill) are also at increased risk of SIBO. Another common cause of bacterial overgrowth is statis (dysmotility) in the gut, which allows the bacteria to proliferate because the contents of the gut do not get pushed through quickly enough. Irritable bowel syndrome and certain medications like pain killers (narcotics) and proton pump inhibitors are common causes of stasis, as are many of the conditions listed above. Once present, bacterial overgrowth may cause inflammation in the mucus lining of the intestine, further exacerbating SIBO and its typical symptoms. The gold standard for diagnosing SIBO is an invasive, expensive, and rarely used test in which contents are collected from the small intestine and the numbers of bacteria are directly measured. To make SIBO detection easier, breath tests are used instead. A number of breath tests are now available and are becoming commonplace in gastroenterologists’ clinics, although there is some disagreement as to which tests are the most accurate and exactly how they should be interpreted. The most common tests are hydrogen breath tests. Patients are given a specific amount and type of carbohydrate (usually in the form of glucose and lactulose) and then hydrogen concentrations in the breath are measured over a period of time. With SIBO, bacteria in the small intestines ferment these carbohydrates and hydrogen is produced. Conventional SIBO treatment is currently limited to oral antibiotics with variable success. Typically, a short course (10-14 days) of rifaximin is used. Rifaximin is a unique antibiotic in that very little of it actually gets absorbed—most stays in the gastrointestinal tract. This means it is generally less toxic and therefore better tolerated than most antibiotics. However, rifaximin is extremely expensive and can still cause allergic reactions and/or a number of adverse effects, including, ironically, adverse effects on the gut microbiome. Perhaps most importantly, when used as the sole therapy, rifaximin’s success rate for SIBO treatment is only 49.5%. Repeated courses of the antibiotic frequently must be used. A recent study conducted by physicians at John’s Hopkins and the University of Pittsburgh, which you can read about in SIBO Treatment with Herbs Is as Effective as Antibiotics; Combine with a SIBO Diet for Even Better Results, found that SIBO treatment using herbal supplements containing combinations of herbs with antimicrobial properties was as effective as rifaximin. Many natural and integrative practitioners today are testing and treating patients for SIBO using combinations of conventional antibiotics, herbal antimicrobials, and other natural-based therapies, including various versions of the SIBO diet, which restricts carbohydrates for a limited time in order to reduce the bacteria’s food source. In part 2, learn about the best diets for eliminating SIBO symptoms and how diet can best be combined with herbal antimicrobials for the most effective natural SIBO treatment. Ther Adv Chronic Dis. Sep 2013; 4(5): 223–231. Parkinsonism Relat Disord. 2014 May;20(5):535-40. Indian J Endocrinol Metab. 2014 May;18(3):307-9. J Crohns Colitis. 2014 Aug 1;8(8):859-65. Ann Rheum Dis. 1993 Jul;52(7):503-10. Can J Urol. 2011 Aug;18(4):5826-30. Glob Adv Health Med. 2014 May;3(3):16-24.
allergic reactions, anemia, antibiotics, antimicrobial, arthritis, b12, b12 deficiency, bacteria, bleeding ulcers, bloating, bowel disease, bowel syndrome, celiac, celiac disease, chronic prostatitis, cirrhosis, diarrhea, diet, digestion, digestive, fermenting, fibromyalgia, fibromyalgia, food, gastric acid, gastrointestinal, glucose, gut bacteria, gut microbiome, health, heartburn, hepatitis, herbal antimicrobials, herbal supplements, hypothyroidism, inflammation, inflammatory bowel, inflammatory bowel disease, integrative, irritable bowel, irritable bowel syndrome, joint and muscle pain, mucus, muscle, muscle pain, natural sibo treatment, nutrients, pain, pain killers, Pancreatitis, parkinson s disease, pneumonia, prostatitis, restless leg syndrome, rheumatoid, rheumatoid arthritis, rosacea, sibo, sibo diet, SIBO symptoms, sibo treatment, supplements, treatment with herbs, ulcerative colitis, ulcers, vitamin, vitamin b12, vitamin b12 deficiency. Anti-toxin treatment for SIBO is the present treatment utilized by gastroenterologists. Anti-toxins decrease or dispense with the bacterial excess and switch intestinal irritation causing malabsorption of supplements. An assortment of anti-toxins has been utilized as a part of the treatment of SIBO including antibiotic medication, metronidazole, amoxicillin/clavulanate, ciprofloxacin, and doxycycline. More as of late, Rifaximin has been appeared to be 80% viable in treating SIBO and normalizing hydrogen breath tests. I thought you might be interested in this article on https://universityhealthnews.com: Could Your Digestive Problems be SIBO Symptoms?